I’ve been a little distracted lately by the 40K universe… I have been reading Hammer of the Emperor and the epic battles on Golgotha got me excited about all the “Epic scale” 40K stuff I've had ferreted away in the Hobby Dungeon…. Some I’ve had for ages, other stuff my friend John picked up of Kijiji a year ago – because it was too good of a deal to pass up – but not being a miniature painter he dropped it off with me and I’m to paint the Man o’ War minis that he got in the box for him at some point to use with Dread Fleet…. Most of the Space Marine and Imperial stuff I’ve had for years… the Ork stuff (and Squat and Chaos stuff that I haven’t even had a look at yet…) is all from John… I also have a pile of Eldar stuff which is an even mix of stuff I’ve had and stuff from John. I was planning on using Future War Commander to play out Epic battles with these legions… I like the idea of using stands as “platoons”. But I don’t think the Space Marines in the 40K universe are organized in “platoons” per se. It seems from the fluff I can find that they are organized in companies of ten squads. So I guess these stands will represent to or three of those squads (and two or three APCs) and I’ll have about 4 of each per company. All of the figures pictured in this post are from Games Workshop. They are © and ™ Games Workshop and painted by myslef and posted here entirely without their permission. Space Marine infantry and Rhino APCs and command. Space Marine Terminators and a Land Raiders from the First Company (which is where you apparently find veterans and Terminators and Land Raiders). 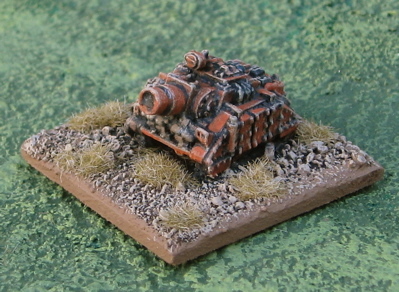 I need to finish up a few more Land Raiders for this company. I’ve done the Space marines in orange for a number of reasons. The very first Space Marines I ever painted I did in orange – these were those very first multi-part pose-able plastic Space Marines that were like $20 for a box of thirty…? Anyone remember those? Anyway, I think I called them the Emperor’s Jesters and even had a chapter badge that looked like a jesters head… I have no desire to call these Emperor’s Jesters… but I still like orange. 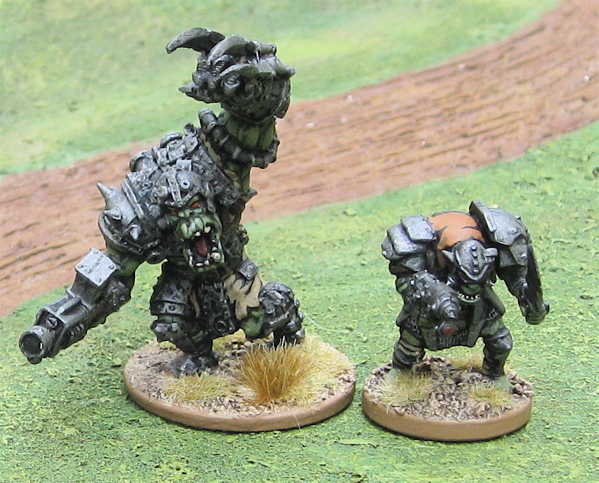 Of the Guard stuff I had, most of it is “support” – I had a few Basilisk self-propelled artillery, a couple Gorgon assault troop carriers, two Sentinels reconnaissance walkers, and these Ragnarok tanks pictured above. In the stuff I got from John there were a few Bombard self-propelled siege guns, a Death Strike Self-propelled missile launcher and a Capitol Imperialis moblie fortress, and a Leviathan Armoured Imperial Command Centre. Not much of a force… No “sharp end” units (infantry or tanks – or at least not enough tanks for a regiment…). 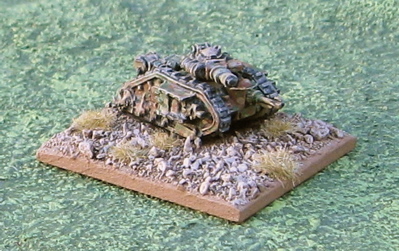 So I’ve been looking for some more Imperial forces on ebay… I did manage to pick up two Leman Russ Battle companies (22 tanks – at three per company that would make SEVEN companies – the Ragnarok tanks an eighth! Huzzah! ), but I have yet to pick up any Guard inafantry. I’m pretty much about to give up – the few lots I’ve seen went for absurd amounts of money. 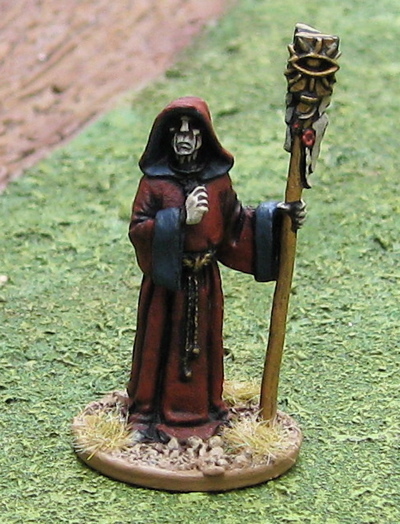 I’ll probably end up getting some sort of stand in from Dark Realm Miniatures or Ground Zero Games. 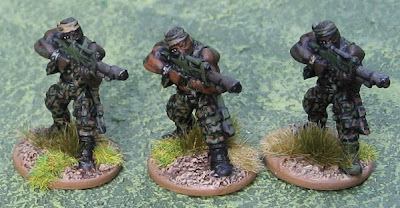 (The Dark Realm Pax Arcadian Infantry look promising). When will I actually have enough of these to play a game…? Who know!? If I keep reading that Black Library fluff it may end up being sooner rather than later! Hopefully I'll get around to posting some game reports from the last week or so... and maybe get in anotehr game or so over the weekend! 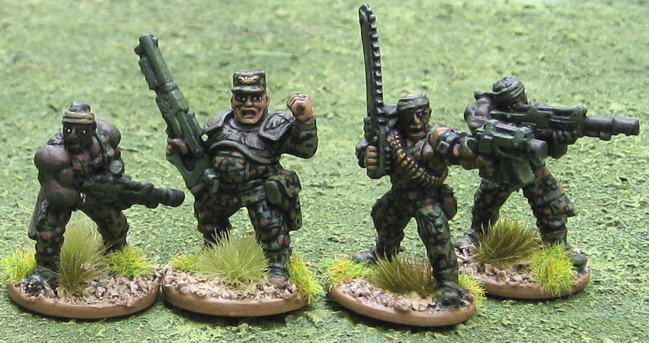 A few more Imperial Guardsmen. 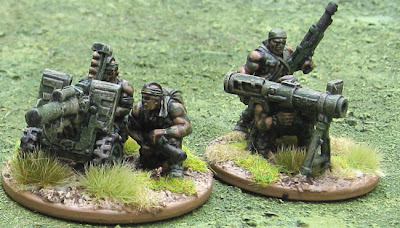 I started picking up these “Catachans” a few years back to use in a Savage Worlds Sci-fi Campaign – they were all to be members of a rival Mercenary unit the Players were often coming up against called “Morgan’s Marauders”. In the immediate future they may actually be used as Catachans as I’m planning on running the free intro Only War mission for the kids some time. Who knows what they’ll be used for in the future. I have about a platoon sized force of these jungle fighters – about half are actually GW Catachans, others are other GW Imperial Guard (from before there were Catachans and Tallarn and Vallalans and Cadians and whatnot…) and a few i-Kore/Void Vasa Commandoes. I decided a week or so ago I should try and finish the force up and decided to break it down into three groups – There are three different poses of metal Catachan Guardsmen with Lasguns, so in each batch I have a few guys in the same pose plus a couple of support weapons. The guys above are one such grouping of same-pose-guys. 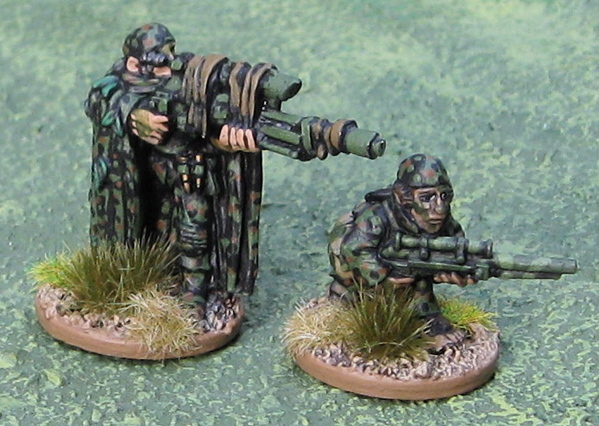 Finally a Catachan sniper and a Ratling sniper. A couple very late battle reports from last week and some EPIC distractions!! 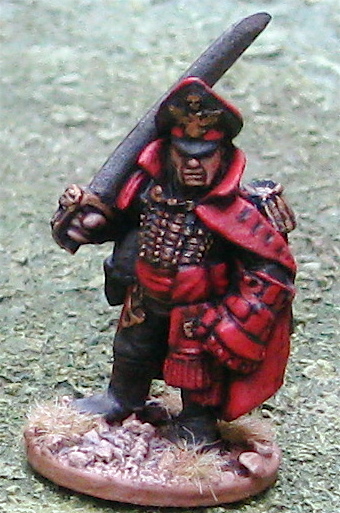 An Imperial Guard Commissar from Games Workshop. A few more Catachan Guardsmen – also from Games Workshop. Some Catachan Support units – you guessed it - also from Games Workshop. A wounded Cadian Imperial Guardsman... again... Games Workshop. 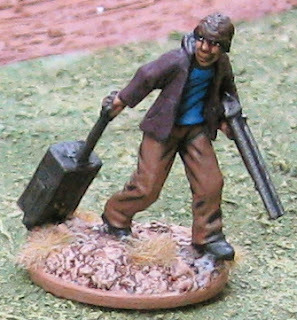 A Zombie Apocalypse Survivor from Reaper Miniatures. More of the same… and maybe a game report or two. Imperial Naval Officer and a Sanctioned Psyker from Games Workshop. 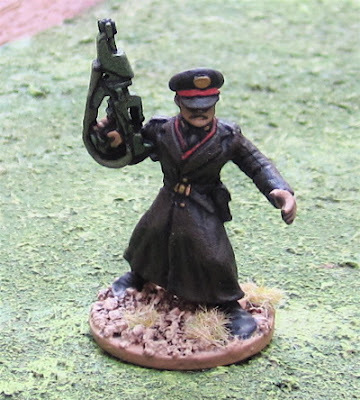 I have a few more Imperial Guard types and Space Orks on the go… Then… THEN I’ll get back to Great War stuff (maybe…). What do I call this!? Robotic Brain in a Jar…? That makes it sound like the brain itself is robotic… Whatever it is it reminded me of one of the evil nazi villains from the Hellboy comics. 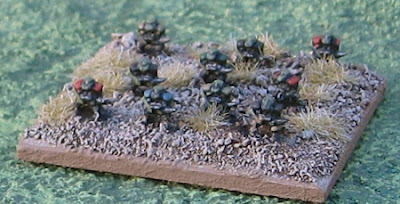 The miniature is from Black Cat Bases. Actually I finished painting the mini ages ago, but misplaced the Jar. I wish I'd had something I could have filled it with to make it look like it was suspended in... something... 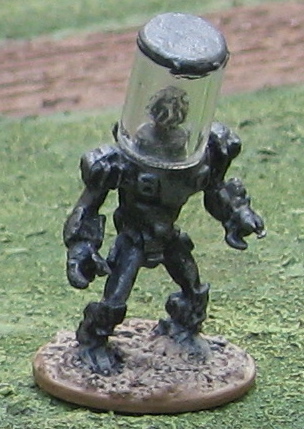 I'd thought of trying to paint the inside of the tube/jar bit with some blue-ish green colour, but then realized to make it translucent enough to see through I'd have to water the paint down to the point where there would be no way it would stick to the inside of the plastic... Ah well... It's still pretty cool. Ooh! And that makes 700 28mm foot figures I've painted so far this year. I'm slowing down. Until this last month I was doing ~100/month... I'll have to pick up the pace to finish 1200 this year! I'm also a bit behind with the painting of vehicles and mounted stuff - but at least i've painted way more than I've bought so far - and I intend to keep it that way!! I also just picked up a few more things off ebay today... Mostly 40K related... an Orc warbike, a Chimera IFV, two more Ogryn, and some other Imperial Guard stuff... and a few Epic tanks... (I've been feeling the urge to bust out Future War Commander again...). More sci-fi or Great War stuff…. 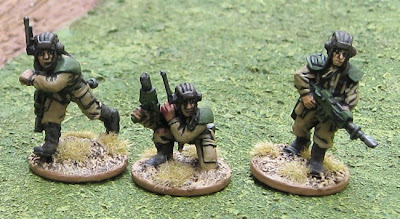 First squad of some Imperial Guard Cadians (from Games Workshop) that I recently picked up off ebay dirt cheap-ish and repainted… I ended up with four whole squads a platoon command and a company command. I thought these would be easy to paint with the kids. 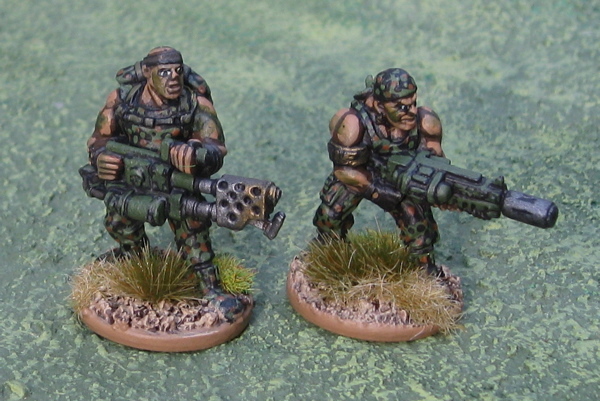 A couple of “Marauders” from Mantic Games that I thought might make good opponents for the Imperial Guard. Again, I thought these would be easy to paint with the kids…. Like the zombies – it doesn’t matter if they look a bit “rough”... unfortunately Mantic minis have a bit more detail on them than your average GW figure. The price was right, though. 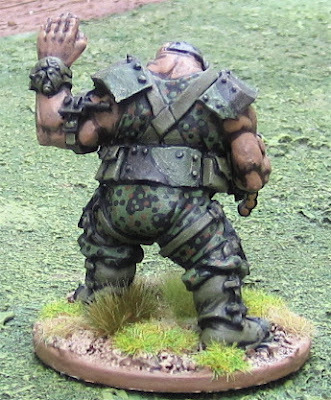 My friend Mr. Miller hooked me up with 20 of them that he was never going to get around to painting in exchange for continuing to cut MDF bases for him, and then I found this big’un and another platoon box of 20 in the 50% off bin at the Dragon’s Den - so we now have 40 or those to paint up as well! In some other gaming related news… the game schedule and information is up for ToonCon 2013 (20-22 September 2013) and I will be running a game of Ambush Z on the Friday evening and Force on Force on the Saturday evening. 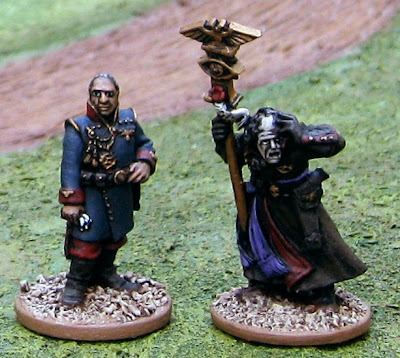 I haven’t really worked out scenarios for either yet, but I’ve got a month, so… I will also be helping out with Wargaming Nineteenth Century Europe 1815-1873 on Saturday afternoon. Um…? I should get a few Space Orks done, then I could play the game I've been planning to run for the kids... then...? 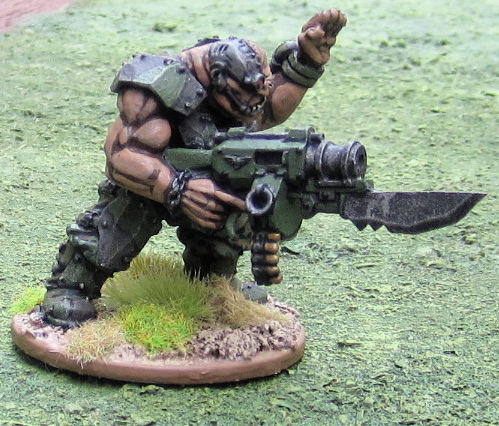 This is an Ogryn with a Ripper Gun from Games Workshop. I’ve painted him in the same camouflage as the Catachan troops I’ve been working on as well. 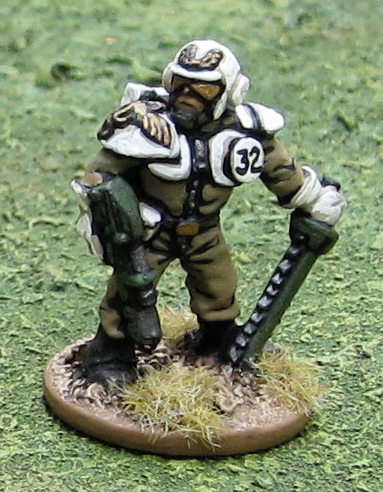 In the same vein as the Imperial Guard and other futuristic troopers of the previous post…. This figure is actually an out of print mini from Mongoose Publishing’s Starship Troopers line. I think he’s supposed to be a telepath or something…? Whatever Neil Ptrick Harris’ character was… I though he’d make a good stand in for an Imperial Guard Commissar. I’m not sure what happened here… This past week I’ve been obsessing a little over the Warhammer 40K universe...!? Ever since Fantasy Flight Games published Rogue Trader a few years back I’ve been having moments of nostalgia – thinking back to those teenage days of playing the original Rogue Trader… Playing games set in a universe a little darker than that of Star Wars or Traveller… Anyway, I’ve been wanting to pick the book up for a while, but $65-70 is a bit steep for a book that I only want to read the fluff from (I have no desire to use the system – percentile systems just don’t do it for me…). The game also looks a bit limiting in that I think you only play the “Rogue Trader and his most trusted counselors”… The original Rogue trader just gave you a simple skirmish game (including a system whereby you could make your own damn troops and aliens and vehicles) and some cool fluff and you were basically let loose in this universe to wreak havoc! 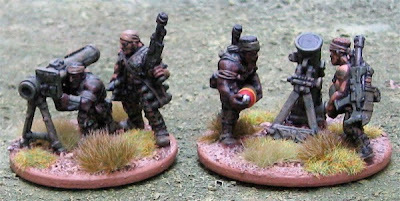 These are some support teams for the Catachan Jungle fighters - also from Games Workshop. Here they are with the rest of the force so far. Lots of these are I-Kore Void Vasa commandos. I have another 25 or so of these I can paint up. I’ll have about a platoon of three or four squads of 10 troopers… plus some support weapons (2 rocket launchers, the autocannon, a light mortar and a heavy mortar) and a platoon HQ and Snipers and stuff. (Oh, I also tracked down and watched the Ultramarines movie…). 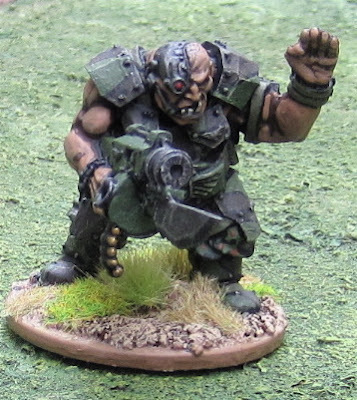 An Astropath - also from Games Workshop - this is a more recent purchase… like, this week… I figures he could be handy in either an Only War scenario/campaign as perhaps an object to be protected/rescued, or as a major player in a Rogue Trader campaign. 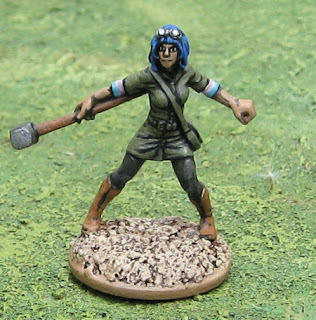 The kids have also been fired up about painting more miniatures (well, at least the girl is… the boy would rather play with them… he could care less if they’re painted or not – but we’ll fix that!!) so I picked up a few squads of plastic Cadian Imperial Guardsmen off of ebay for them to mess around with when they arrive. Oh, who knows at this point. Could be more 1914 French, could be more 40k Catachans… or something altogether completely different!